Adiabatic Compression - Extreme Gas is a patent pending Jacketed Multiphase Pump which can handle gas in excess of 99.6% GVF. Designs are available exceeding 44 MMSCFD with very high differential pressures. All are custom made to customer's requirements. It can handle sour gas. All well bore fluid are passed through the screws. The complete system is jacketed for cooling when handling extreme gas. The systems can be made in series or parallel as shown in the PDF below. We provide a complete turnkey package. The PMP is patented in the US and patent pending in all other PCT countries. It is aimed in disrupting the existing Surface Multiphase and large Liquid Pumps market around the world. It is Zero Leak. Absolutely no leak. It is a fully canned system. The complete system follows stringent QA as such we also do complete system leak test with Helium and measure the leak rate with Helium sniffers for very sensitive areas like Alaska, North Sea etc. for 100% reliability for Zero Leak. There is no possibility of mechanical seal leak or and no mechanical seal flush plans are required. All mechanical seals are internal. It has no preventive maintenance at all. There is no need to stock spares such as mechanical seals or any other. It has built in redundant system so if one system fails the pipe line can still be fully operational as before while you maintain the failed pump. There are multiple pumps in one cluster. Merely increase the speed of the other pumps to compensate rates when one pump fails. There is also a free line for free flow when there is a power outage or if you need to send pigs to clean the pipe lines. There is no change of oil for the pump. It uses Nano oil which coats as you operate creating reduction in coefficient of friction as you apply load. It is shipped ready to install after testing at our shop. It uses highly reliable downhole technology (subsurface) on surface. 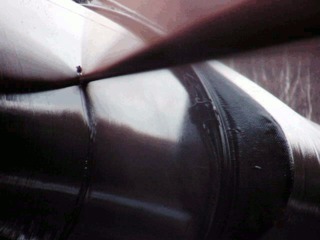 The submersible motor’s heat is transferred to the pumped fluid reducing viscosity. There is no requirement for buildings or weather protection. It will look just like a pipe line. The client does not have to send anyone to monitor the system at site. It can be landed vertical up a hill, slanted down a hill, horizontal or any incline for that matter. Hardly any site preparation is required to install. Just have to inform us before building the system. There is no need for extra bracings other than arresting to the ground by simple methods. It can supplied with adiabatic compression if required to save on hp. This is an Optional Feature for multiphase applications. It can be designed to run in reverse for eg. if there is a leak say 100 kms away in the pipe line you can switch to reverse within seconds from the control room before you can send the personnel to plug the leak. This will start pulling the medium outside the pipe line cutting off the leak instantly. The discharge becomes the intake and the intake becomes the discharge. However, you should avoid check valves in the pipe line. Reverse flow is an Optional Feature. You can go from 100% liquid to 97% gas continuously even with slugs of gas with intermittent 100% gas if required. It must be requested for 100% gas to incorporate sump in the system. The client does not have to be concerned about anything except connect the two end flanges to the pipe line. As far as the client is concerned it will just look like a pipe line and nothing else. It has pressure compensated built in system as such you can have 5000 psi (34,450kPa) intake pressure without any adjustments, except to inform us when the request is send out for quotation. 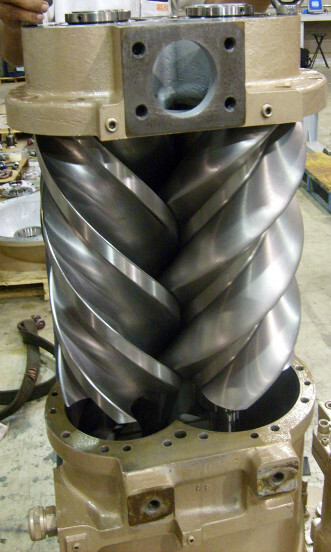 It can be designed and build to do differential pressures of up to 3550 psi (24,460 kPa) maximum. It can handle heavy oil, light oil, high gas, combination of water, gas and oil complete with the same equipment. It is Operator Proof and there is no other intervention required except changing speed for rates which can be programmed in the VSD. Generally you don’t need any strainers or filters and these are optional to increase life and protect the pipe line from rags or other field foreign materials. It has major savings in OPEX compared to any other Multiphase or Liquid pumps used in the Oil & Gas industry. We have a design range from 150 to 1,250,000 equivalent barrels per day per cluster supplied. One cluster PMP may have multiple pumps but only two end flanges to connect to the existing pipe lines. A simple flange connection of the ends. Redundancy systems at its best.